Our lead systems designer share the reasoning behind some recent class changes. Rune Strike now deals 25% more damage. Howling Blast had its area-of-effect splash damage equal to 50% of the damage taken by the primary target (down from 65%). Unholy Frenzy damage will no longer break crowd-control effects that break on damage. Frost Bomb now deals 40% more damage. Frost Bomb now deals 60% of its damage when used against other players, down from 80%. Living Bomb now deals 40% more damage. Nether Tempest now deals 40% more damage. Spirits summoned by Storm, Earth, and Fire should now deal the correct amount of damage with Rushing Jade Wind. Shadow Word: Pain now deals 25% less damage. Corruption now deals 25% less damage. Blood Horror now checks that the Warlock has at least 5% health before casting. Deep Wounds now deals 50% more damage for Protection Warriors. Shield Slam now deals 25% more damage. Flight in the Firelands: Fixed an issue where players were unable to complete the quest. Pterrible Ptorment: Spawn rate of Tormented Skyscreamer has been increased and fixed an issue where players in certain situations were unable to complete the quest. Gusting Grimoire is now a Rare quality companion pet. 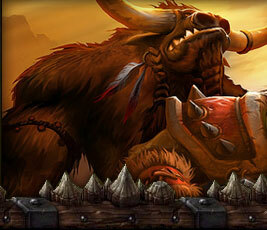 Our lead encounter designer offers their thoughts on feedback regarding raid boss hotfixes. Reduced the health of adds in the Horridon encounter by 15% for 10-player normal mode and 10% for 25-player normal mode. Fixed an issue where images of Past Self created by Alter Time could be killed during the encounter. Kazra'jin's Reckless Charge should no longer hit players twice at the point of impact. Fixed an issue in Challenge Mode where players may not receive credit for killing Lilian Voss. Malevolent Gladiator's Endgame now matches Malevolent Gladiator's Reprieve in PvP Power and PvP Resilience. The additional 274 PvP Power has been replaced with 274 PvP Resilience. Increased the activation chance for agility and strength trinkets from Throne of Thunder by 10%. Fixed an issue where players may be unable to obtain Isle of Thunder daily quests for Stage 2. Fixed an issue where some players may be unable to loot Isle of Thunder rare spawns.